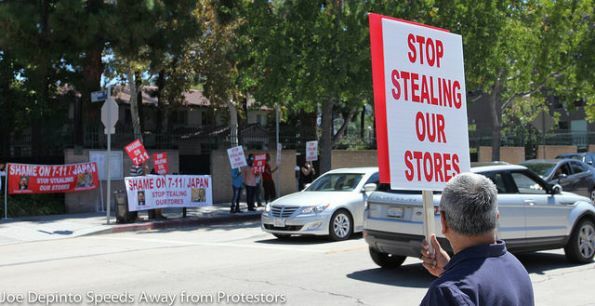 7-ELEVEN Franchisee Protest Photos: 7-Eleven franchise owners continue to stage protests against their franchisor 7-Eleven, Inc., CEO Joe DePinto, parent Seven and I Holdings Co. and Seven and I Chairman Toshifumi Suzuki. (UnhappyFranchisee.Com) The photos below were taken at a 7-Eleven protest outside of CBS Studio Center, 4024 Radford Ave, Studio City, CA on August 27, 2014 and posted to Flickr by dukhiloga. Information by dukhiloga indicates that 7-Eleven Joe DePinto was at CBS Studio Center for business-related taping. Other 7-Eleven personnel were also spotted entering CBS. Joe DePinto was reportedly spotted in a black SUV, which quickly sped away from 7-Eleven franchisee protesters. Captions on dukhiloga‘s Flickr pictures state “Get Ready for 7-Eleven Experience Vegas 2015” referring to the annual 7-Eleven franchisee convention where protests are expected. ARE YOU FAMILIAR WITH THE 7-ELEVEN FRANCHISE, 7-ELEVEN ASSET PROTECTION & JOE DePINTO? SHARE A COMMENT BELOW. ← Tax Franchise Owners Say Don’t Buy a Franchise! KITTY LITTER DELIVERY: Hot New Franchise?